WinPatrol v16 is still in beta and may be for a while if folks like Microsoft MVP Corrine keeps giving me great suggestions. 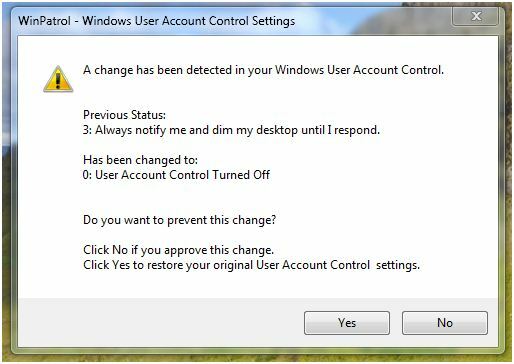 This latest new feature was a must after reports surfaced that User Account Control settings in Windows 7 could be changed by malware. In fairness, as this Microsoft response points out “The only way this could be changed without the user’s knowledge is by malicious code already running on the box”. I’d like WinPatrol users to know we have their back if some malicious program or even a family member changes the UAC settings on their machine. WinPatrol was also the first program to monitor changes to Windows AutoUpdate settings. Sure enough we’re starting to see many trojans and viruses in the wild trying to monkey with autoupdate setting. This beta download is available at http://www.winpatrol.com/beta16.html. I encourgage those of you helping to test WinPatrol to give this feature a drilling both on Vista and Windows 7. I still want to make some changes to text in our new version but if all goes well I can launch WinPatrol v16 in a couple weeks.